Successful businesses assess their organizational processes with a fine-toothed comb. Have you included document disposal in your assessment? In this blog, we highlight the differences between DIY shredding and professional shredding. DIY shredding programs put the onus of shredding on employees. Unfortunately, shredding becomes a low priority for busy employees. They’re more likely to toss a document into a trash or recycling receptacle than hand-feed it into an office shredder. As a result, DIY shredding increases your company’s privacy breach exposure. Professional shredding services streamline document disposal processes. Locked containers are strategically placed throughout your office. Whole files—including staples, paperclips, and sticky notes can be quickly deposited into a collection container. Weekly, bi-weekly, monthly, or on a quarterly basis, the deposited documents are collected by a background-screened and insured shredding technician and taken to a secure plant for shredding. Professional shredding is the best option for optimizing your company’s productivity. A secure chain of custody is critical to any shredding program. In a DIY shredding program, shredded material is discarded into a dumpster. With the right software, dumpster diving thieves can reassemble your shredded documents and retrieve confidential data. A professional shredding service offers a strict chain of custody from collection to destruction. Industrial-grade shredders shred your documents into unrecognizable, impossible-to-reconstruct particles. The entire shredding process is recorded to video and stored for 90 days. You receive a Certificate of Destruction as proof of your company’s compliance with regulatory requirements. To protect the privacy of your customers and employees, choose a professional shredding service. The cost of a DIY shredding program goes beyond purchasing office shredders. Office shredders increase your kilowatt-per-hour energy consumption costs. But more importantly, every minute an employee spends preparing, sorting, and shredding hard copy documents is one less minute spent on revenue-producing activities. A professional shredding service offers a more cost-effective solution for destroying documents. For a low monthly fee, the entire document disposal and destruction process is handled for you. It’s a solution that allows your employees to focus on their core areas of expertise. 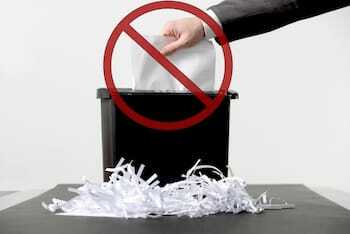 DIY shredding doesn’t offer a verifiable document destruction process. Professional shredding, on the other hand, includes a Certificate of Destruction with the time, date, and method of destruction, offering third-party verification of your regulatory compliance. As you can see, professional shredding offers your business a cost-effective, efficient and secure privacy protection solution.